Summer is here, which means it's time to enjoy cold treats like sundaes and slushy drinks. 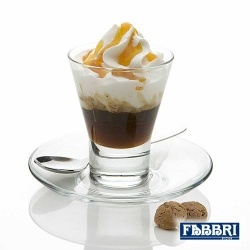 To help kick up the flavour of your summer, we've brought in a variety of drink and dessert syrups from Fabbri. Fabbri's Mixy Cafe line of flavoured syrups is perfect for making cocktails or non-alcoholic Italian style sodas. What sets Fabbri syrups above others is their dedication to authenticity. Fabbri uses real ingredients. Their syrups have double the strength of average syrups, meaning you will only use half the amount of other products. Their syrups are also natural and clean, containing low amounts of additives and sugar. So instead of having an overwhelming taste of "sweetness", you can truely taste the real flavours in their syrups. For dessert lovers, we carry Fabbri's delicious line of Mixy Toppings. Available in wild berry, dark chocolate and maple, you can drizzle these rich sauces on top of ice cream, fruit salad, sweet drinks or desserts of your choice. Their Kroccant Chocolate sauce is a particular favourite of ours. Drizzle on top of cold gelato, and it becomes crunchy upon contact. Yum!